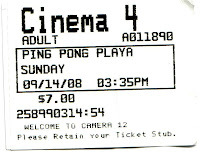 Sunday night, Sep. 7th, Hermann Luechinger and I went to see the San Jose debut of a terrific new independent movie, "Ping Pong Playa" -- a very funny movie that doesn't miss an opportunity to trigger a smile and a laugh. It stars a young fellow named Jimmy Tsai, who is undoubtedly destined for big things, and is directed by the Academy Award winning director, Jessica Yu. Using the vehicle of table tennis as a centerpiece, the movie hilariously explores the trying problems of one Southern California Chinese-American family trying to cope with a son caught between two cultures -- and somewhat out-of-place in each. In the process, the film weaves in members of other ethnic minorities including Indian-Americans and African-Americans, and comically contrasts some of the problems of dealing with the cultural expectations of one's own group to the problems of dealing with the stereotypes of the dominant culture. After the screening, the star, producer, and director conducted a "Q & A" at the theatre, and we all subsequently repaired to a local Billiards Parlour where two ping pong tables were reserved for the audience to take on Jimmy Tsai, the protagonist in the film. Hermann and I, playing with our Hardbat Hocks, managed to hold our own against him, and had a lovely time speaking with all the people connected with the film. The film is playing in a few selected US cities (NY, LA, and the Bay Area) -- and was originally scheduled to only run for a week, but it has since been extended an additional week. I urge everyone, while you still can, to go see this genuinely winning, tellingly-comic and quirky table tennis yarn. The movie is playing now, through Thursday evening, Sep. 18th, at the following Bay Area theatres: Sony Metreon in SF, Shattuck in Berkeley, Cinema12 in San Jose. I would be remiss if I did not mention that we spotted several real players in the film that we, and many of you all know such as Barney Reed, Biba Golic, Mas Hashimoto, Diego Schaaf and Wei Wang. The last two served as consultants for the filmmakers. But all of these players appeared really very briefly. hi everyone! the film will play (at least) another week thanks to the great response! so please check it out this week or weekend with your friends, in san jose, sf or berkeley, or the other cities- irvine, houston, seattle, ny!